Fashionistas have been salivating at the thought of Beyoncé‘s Thierry Mugler designed tour wardrobe, and now the first pics are finally in! Marking the designer’s long-awaited return to the fashion industry, following a hiatus to concentrate on couture and fragrance collections, Mrs Jay Z tempted him back, enlisting him to create a 58-piece wardrobe for her upcoming world tour. 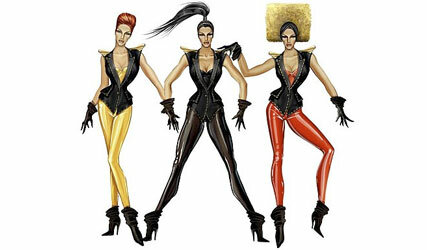 And both Mugler and Beyoncé fans will not be disappointed! Taking inspiration from, ‘the duality between being a woman and a warrior,’ Mugler told WWD, he has created a wardrobe of elaborate pieces, such as a scultural sci-fi style one-piece, and waist-cinching corsets teamed with leggings and vertiginous ankle boots.